Akamine C., et al. Markedly Elevated Procalcitonin after Cardiac Arrest: A Case Report. (2016) J Heart Cardiol 2(2): 94-95. © 2016 Akamine C. This is an Open access article distributed under the terms of Creative Commons Attribution 4.0 International License. Background: Procalcitonin (PCT) is an amino acid prohormone of calcitonin that is released by various tissues in response to infection, systemic inflammation or sepsis. High levels of PCT have been described in circumstances other than sepsis or infection, including major surgery, trauma, acute coronary syndromes, cardiogenic shock and cardiac arrest[2,3]. Objective: To describe a patient with severely elevated procalcitonin levels after cardiac arrest and multiple external defibrillations as another diagnosis other than infection leading to its elevation. A 70-year-old Caucasian male with a past medical history of hypertension and alcohol abuse presented to a local community hospital emergency department (ED) after a syncopal episode earlier that evening. He admitted to heavy drinking daily for several months. Imaging of the head and cervical spine were negative for any trauma. In the ED he became unresponsive and the electrocardiogram showed polymorphic ventricular tachycardia (PMVT). He was defibrillated with return of normal sinus rhythm but had recurrent episodes of ventricular fibrillation (VF) and received 10 consecutive external defibrillations. He was transferred to our hospital and on arrival his temperature was 101.0°F and the remainder of his vital signs were within normal limits. Physical examination was unremarkable except for a right wrist splint and edema of the left ankle. Chest X-ray demonstrated left lower lobar atelectasis. He was hypokalemic (potassium of 2.2 mMol/L) and his cardiac enzymes were mildly elevated, Troponin T was 0.05 ng/mL, CK 210 U/L and CKMB 2.4 ng/mL. His lactate was elevated at 3.0 mMol/L and he had a markedly elevated procalcitonin at 45.98 ug/L. His blood ethanol level was < 0.010 g/dL. Blood and urine cultures demonstrated pan-sensitive Escherichia coli and broad-spectrum antibiotic therapy for severe sepsis was initiated. While in our ED he again had multiple recurrent episodes of VF requiring five additional external defibrillations totaling sixteen. He underwent urgent coronary angiography which showed a left main stenosis of 70% and a right coronary artery total occlusion with collateralization from the left circumflex artery. An intra-aortic balloon pump (IABP) was placed and cardiothoracic surgery was consulted but declined to perform coronary artery bypass grafting (CABG) due to concern for severe sepsis given the procalcitonin elevation and blood and urine culture positivity. 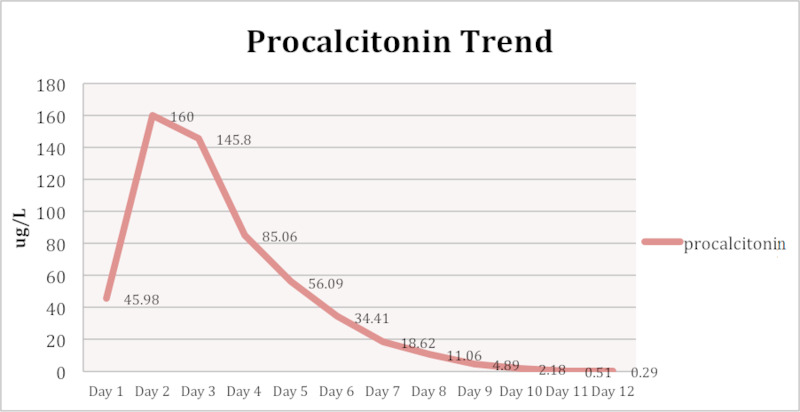 The procalcitonin rose to 160 ug/L on day two, and declined daily thereafter (Figure 1). The IABP was removed on hospital day three given hemodynamic stability and the patient was extubated on hospital day five. The remainder of his hospital course was complicated by methicillin resistant staphylococcus aureus health-care associated pneumonia and encephalopathy. Given the complicated hospital course and overall frailty CABG was not performed. The patient was discharged to a skilled nursing facility after 31 days in the hospital. Few studies have been conducted on the role of PCT after cardiac arrest and recurrent external defibrillations. Some data suggests that the course of PCT concentrations post-cardiac arrest may reflect the duration and impact of organ and tissue ischemia and thus provide prognostic information[2,3]. Although sepsis was a concern from the date of presentation, the degree of PCT elevation in this patient may suggest another etiology. PCT levels reported in the literature of patients with urinary tract infections report maximum PCT levels far lower than those observed in our patient, for example Van Nieuwkoop et al., reported a maximum of 9.07 ug/L. In our patient, the PCT was observed to dramatically increase after cardiac arrest and recurrent external defibrillations and thus seemed correlative. The role of procalcitonin in clinical practice is evolving and its applications beyond the diagnosis of sepsis deserve further investigation. 1. Maruna, P., Nedelníková, K., Gürlich, R. Physiology and genetics of procalcitonin. (2000) Physiol Res 49(Suppl 1): S57-S61. 2. Engel, H., Ben Hamouda, N., Portmann, K., et al. Serum procalcitonin as a marker of post-cardiac arrest syndrome and long-term neurological recovery, but not of early-onset infections, in comatose post-anoxic patients treated with therapeutic hypothermia. (2013) Resuscitation 84(6): 776-781. 3. Hottenrott, S., Schummer, W. Value of procalcitonin as an outcome-parameter after cardiac arrest. (2013) Resuscitation 84(1): e25-e26. 4. Van Nieuwkoop, C., Bonten, T.N., Kuijper, E.J., et al. Procalcitonin reflects bacteremia and bacterial load in urosepsis syndrome: a prospective observational study. (2010) Crit Care 14(6): R206.